I'm excited the new academic standards for English language arts and mathematics were developed for Oklahoma students by Oklahomans. I support approval of the new standards during this legislative session. This is not inconsistent with the need to make some improvements first. 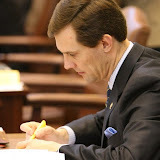 The main goal of House Bill 3399 in 2014, was to repeal the Common Core State Standards (CCSS) and to put the responsibility for Oklahoma's academic standards back in the hands of Oklahomans and to put academic experts in Oklahoma together to write new English and math standards. I'm grateful that so many educators gave so much of their time to create the new standards. This was the first time that experts in Oklahoma from common education, career and technology education and higher education came together to develop academic standards. Some have suggested I've held myself out as an expert on academic standards because I have an opinion. The truth is, I've never held myself out as an expert on much of anything. However, regarding the new academic standards, I have read what experts in Oklahoma have to say and from this I have formed an opinion. From virtually everything I've read, the new standards are an improvement over our current standards. But a review and comparison of the new standards and the CCSS by experts at the University of Oklahoma suggests that some improvements may be warranted. The South Central Comprehensive Center at the University of Oklahoma which is funded by the United States Department of Education was chosen by the state Board of Education to develop the comparison. The comparison was sent to state Supt. Joy Hofmeister on January 25, 2016. It was then provided, along with the new standards, to legislators on February 1, 2016, and posted on the state Department of Education's website. The comparison indicates that the new academic standards are an improvement over Oklahoma's current standards and the CCSS. That said, the comparison does mention a few needed improvements. On page 7 of the comparison, in analyzing the progression and coherence of the English language arts standards for pre-K through fourth grade, it states there is an "assumption that the complexity of texts increases as students advance to later Grades." I have been told by knowledgeable educators in Oklahoma that this should not be left to assumption. Supt. Hofmeister has stated that exemplars were not included in the new English standards because the law prohibited text exemplars. This is not true. The law does say "reading lists" shall be determined by school districts. However, the law doesn't prohibit exemplars which are not considered a reading list by practice or by law. On page 15, the comparison states both the new standards and Common Core, "Would benefit from minor revisions (Including some confusing terminology) to enhance clarity and coherence and to balance rigor with developmental appropriateness." Specifically regarding the new standards, the report points out that the new math standards, "Do not explain relationship between standards and objectives." On page 17, regarding the general analysis of the rigor of the new math standards, "Level of rigor is not consistent across grade bands." On page 18, "While the content expresses intent to find a balance between rigor and developmental appropriateness, this is not always accomplished." On page 18, "the default minimum could leave students unprepared for later learning." On page 18, "Some standards and objectives lack rigor, which could limit potential of students." On page 20, "Verbs are used to clarify the level of rigor expected at each grade level with similar content; occasionally, the verbs for one Grade seem lower level than the verb used in the prior Grade or course." On page 21, "The standards convey a unified vision of mathematics and attempt to show the connections between number sense & operations, algebraic thinking & algebra, geometry & measurement, and data & probability. For the most part, this attempt is successful; however, there are a few examples provided below where the connections are unclear. In these cases, the disconnectedness creates a feeling of 'piecey-ness' of the standards and their objectives, as well as between standards within a grade level and across grade levels within a grade band. Occasionally, objectives of the standards are duplicative. Although it appears that choices have been made about what content is most important at each grade level, an introductory statement for each grade level would make this more explicit." Pages 21-22, "Some objectives seem duplicative or overlapping, which will likely cause some confusion … same task of sorting in both with potentially different levels of student performance expected." Page 22, "Some objectives do not link directly to their associated standard, but rather indicate skills leading up to the standard." Page 24, "Ancillary documents, such as expanded glossaries, examples, counterexamples, and philosophical statements about the connections between standards and objectives, would improve the clarity of the standards themselves." Page 24, "Some standards and objectives use words and phrasing that may lead to imprecise mathematical terminology ... . Some standards and objectives will require additional explanation and support for teachers to understand the depth of student performance expected." Page 25, "Some standards and objectives will require additional explanation of terminology and/or expectations for student performance." Page 25, "Some standards and objectives use words and phrasing that may lead to imprecise mathematical terminology or understanding." Page 26, "Some standards and objectives could be more meaningful to classroom instruction if the focus were on formative and/or classroom level assessments." Page 28, "Similar objectives within the same Grade may cause confusion on the level of student performance expected." These are a few of the issues I believe should be reviewed by the state Board of Education and addressed before the standards are finally approved and fully implemented. It is my understanding that these changes could be made within a few days to a few weeks and returned to the Legislature for final approval this session. It is difficult to understand why anyone would oppose making these improvements before final approval and implementation. Some have criticized the Legislature for not acting on the standards sooner. The state Board of Education was required by law to begin the process of developing the new standards in June, 2014. (70 O.S. § 11-103.6a (B.2)). The Board did not begin until March, 2015. The Legislature received the new standards February 1, 2016, the first day of session, due to the 10 month delay. If the Board had followed the timeline set by the Legislature, the new standards would have been ready for review by everyone 10 months earlier. The Legislature would have had ample time to consider the new standards and act on them much earlier this session. I understand from conversations with some of the experts involved in writing the standards and the development of the comparison that some of these improvements have already been made. There is no reason of which I'm aware that these improvements could not be completed and the standards approved during this session. To not do so would be to let up just before the finish line. Thank you and your staff for pointing out your concerns with the current OAS. You state that the standards were presented to the full legislative body on February 1, the fist day of your session. Could your concerns have been presented two or three weeks ago, thus providing time for a conversation with the OSDE Board and those involved in writing the standards? Academic standards, much like laws, should always be reflected upon, in an attempt to improve them for the people (in this case, students) of our state. The standards, in their current state, can be revised over the summer, thus allowing time for teachers and administrators to conduct the OCCT, EOI, AP and other tests the Oklahoma legislative body has determined necessary for College and Career Readiness. On behalf of Oklahoma educators, I urge you and all elected officials to allow the standards, as currently written, to move forward so public education in Oklahoma may move forward as well.